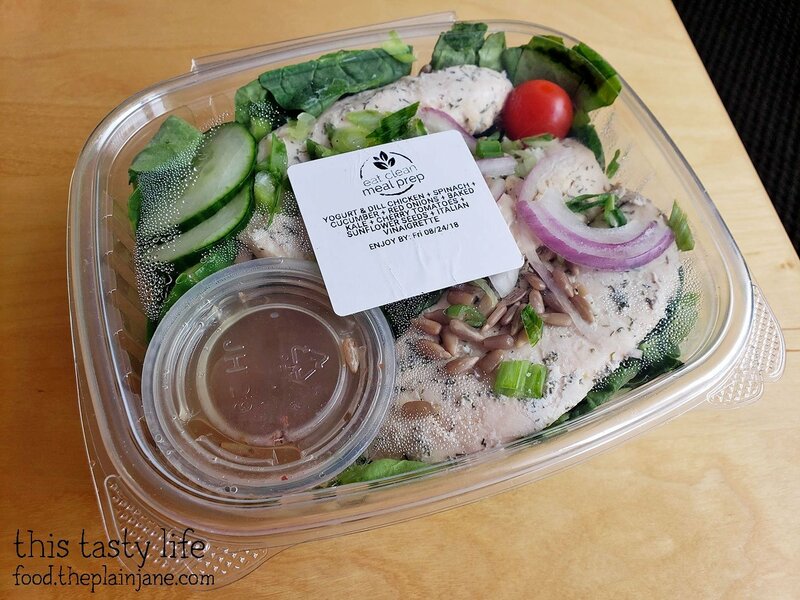 Over the summer (uhh this post is overdue, eh) I was invited to try out Eat Clean Meal Prep service. 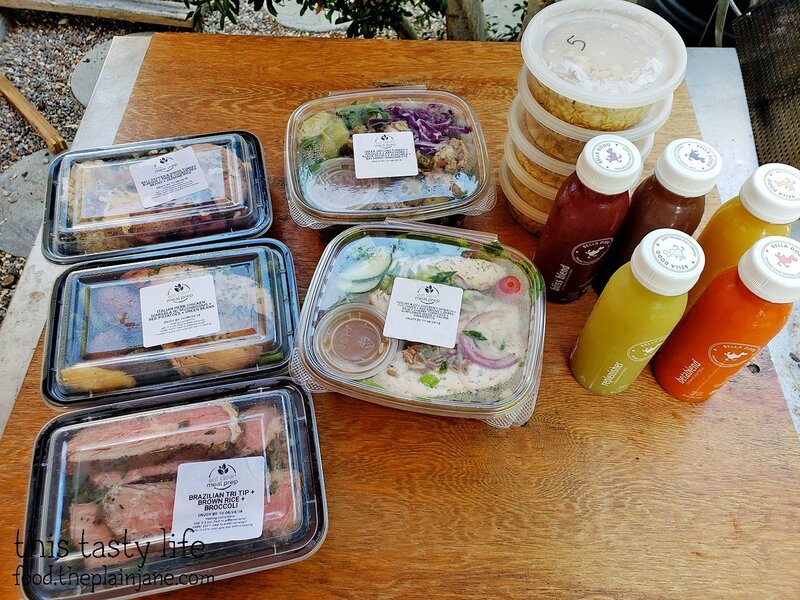 It’s a local service owned and operated in San Diego specializing in creating healthy meal prep services that get delivered right to your doorstep. 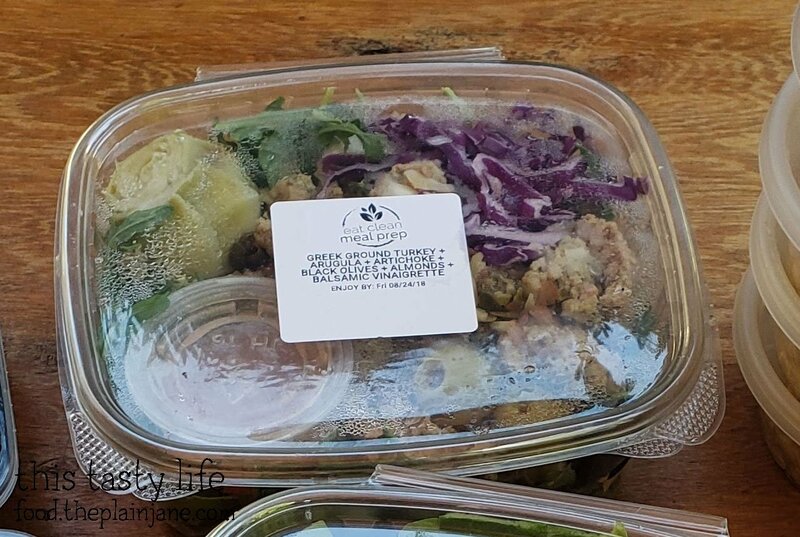 They specialize in making clean, nutritional food for lunch and dinner to help you eat healthier and save you time. 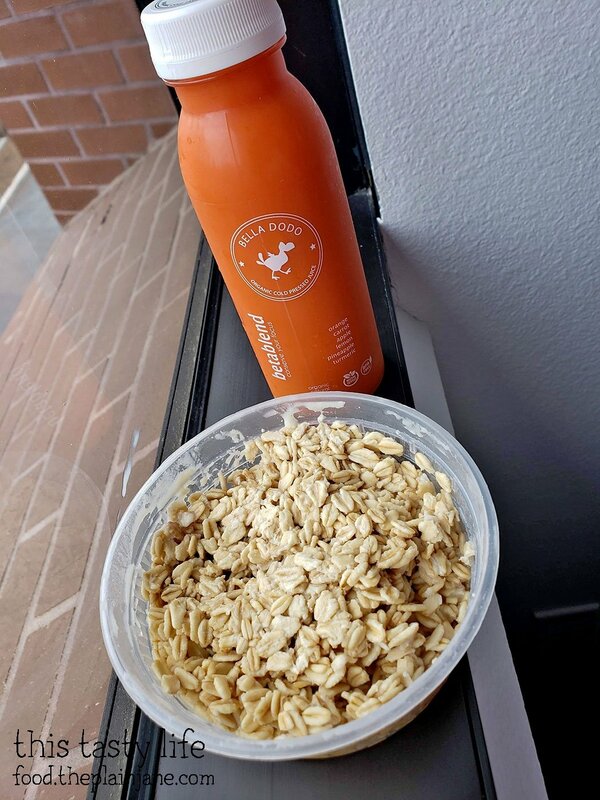 Eat Clean Meal Prep also offers breakfast/juices to be added on to a meal plan service. You can also simply buy things to help with your meal prep, such as spices and proteins, if you don’t want to commit to a whole week’s worth of food. 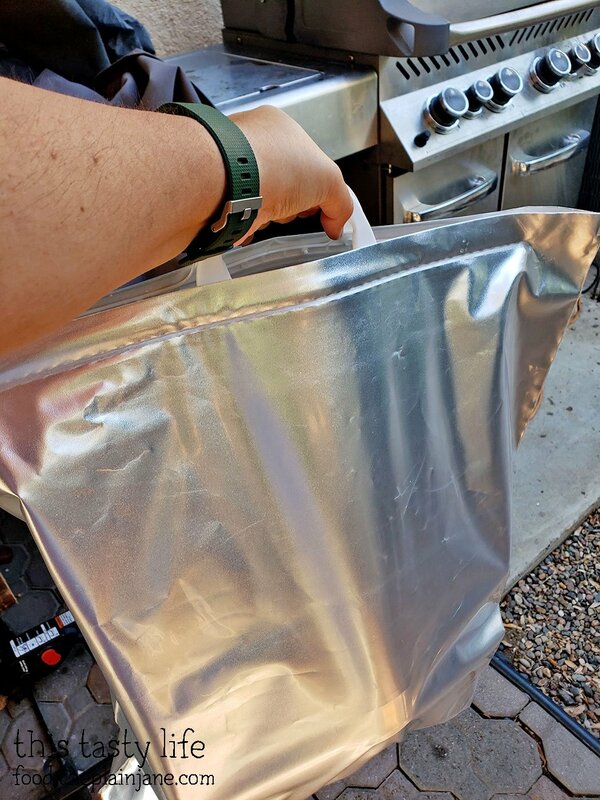 My meals were delivered in a fancy insulated bag right on my doorstep. 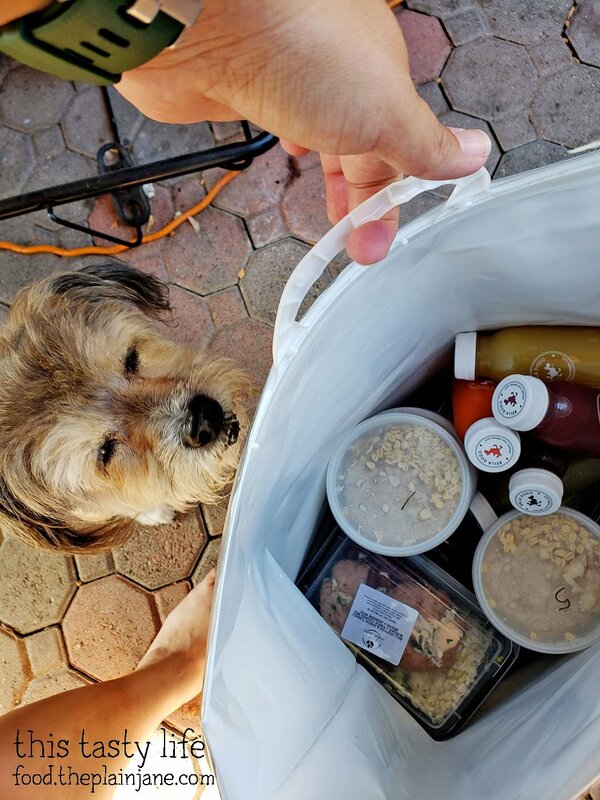 Maya was just as curious as I was as to what was inside this bag from Eat Clean Meal Prep! Here are the goods: three meals, two salads, five breakfast overnight oats, and five juices. I also received three spice mixes to sample. I’ve used this to season up potatoes, vegetables, meats and more. They’re handy since each blend has a unique mix of spices without salt. This way you can control your own salt content on your food. 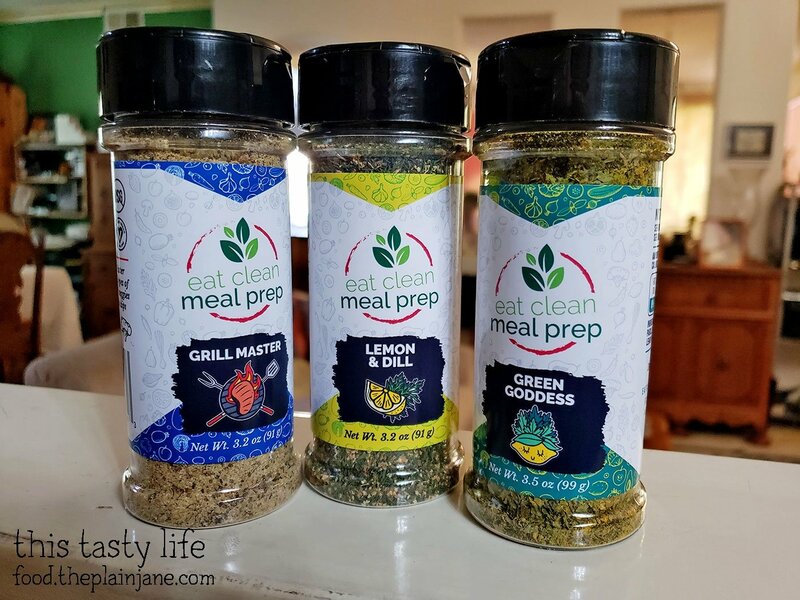 My favorite of the three is the Green Goddess mix which has Garlic, Basil, Parsley, Yellow Mustard Seeds, Lemon Peel, Turmeric, Citric Acid and is inspired by Green Goddess dressing! 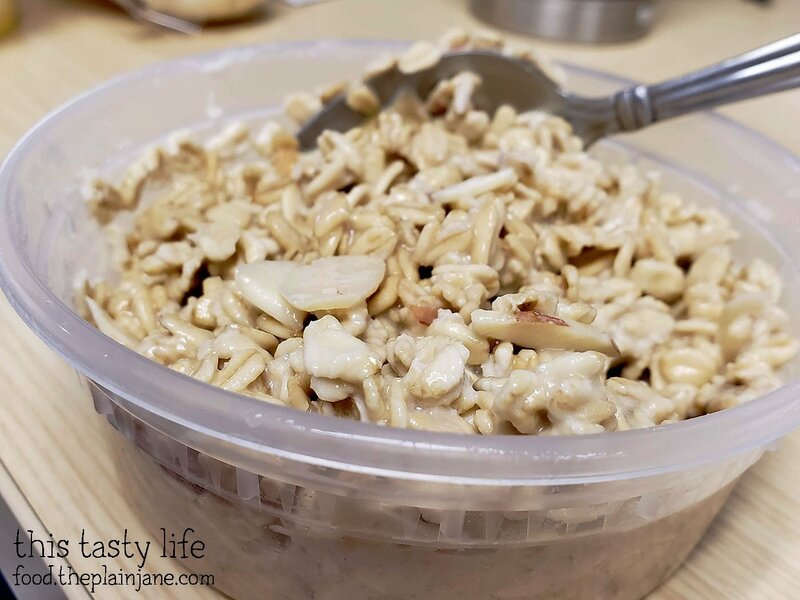 One of the very first Eat Clean Meal Prep items I tried was one of the Overnight Oats. I didn’t have a menu that told me what was what, only numbers on top of the lids. This batch had a maple-ish overtone to it and I quite enjoyed the texture of the oats. They were not too mushy and there was a nice soft texture to the oats. They also didn’t feel like they were drowning in too much sauce/moisture and it was a yummy way to start the day. I didn’t take any notes about the juices – so, I won’t have much to say about them! 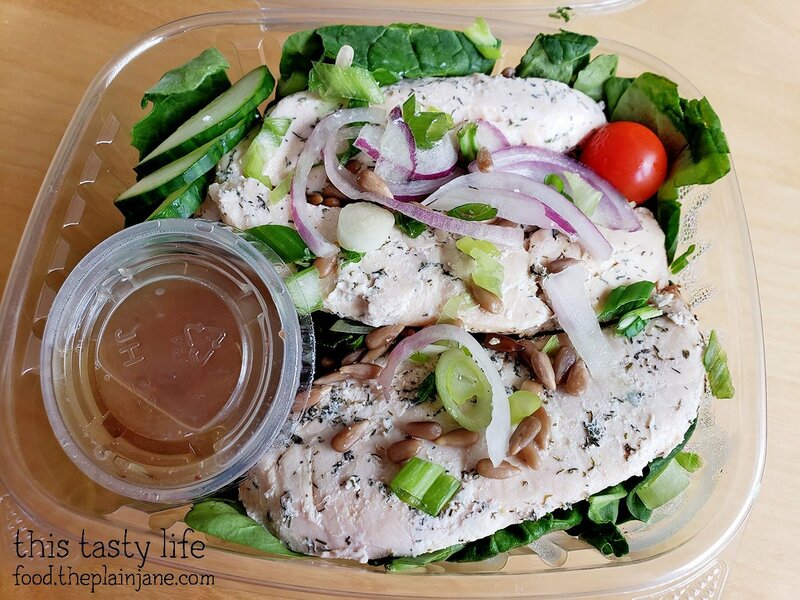 The first Eat Clean Meal Prep salad I tried was the Yogurt & Dill Chicken salad. The label helpfully tells you everything inside. This particular salad had spinach, cucumber, red onions, kale, cherry tomatoes, and sunflower seeds. A peek inside. Green onions are also in here. That wasn’t on the label. 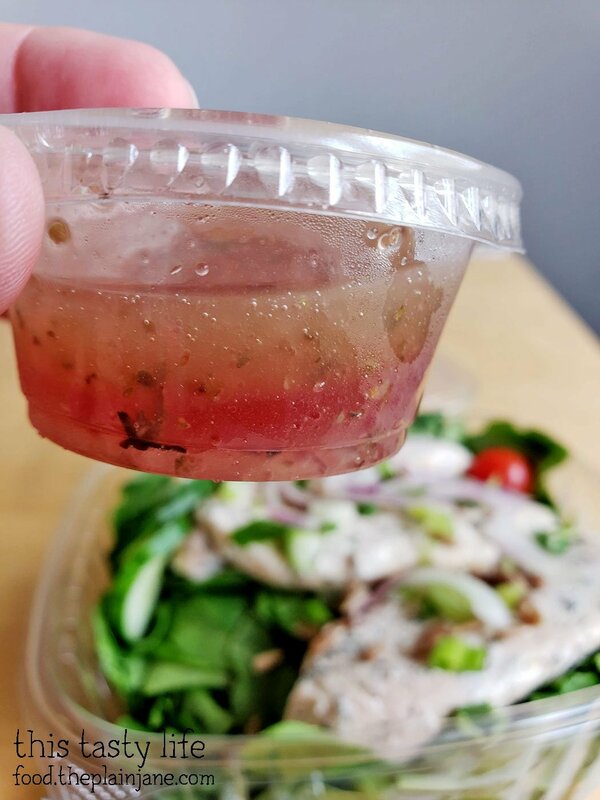 This is the Italian vinaigrette. Since the salad was quite big, I plated up about half of the salad for my lunch. I also added more cherry tomatoes from my stash at home. 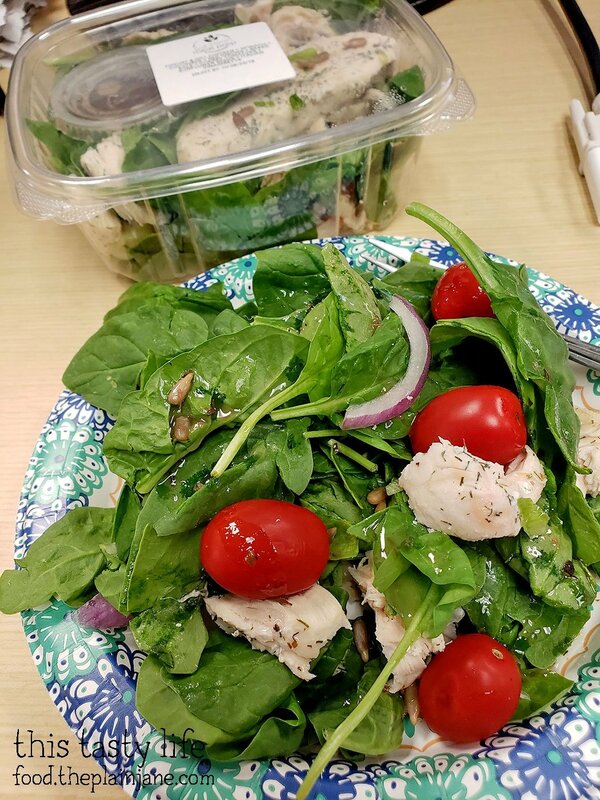 The chicken in this salad had a good flavor and I liked having spinach instead of lettuce in my salad. The sunflower seeds added a nice texture to the salad that made the mouth feel more enjoyable. This salad was a winner for me. 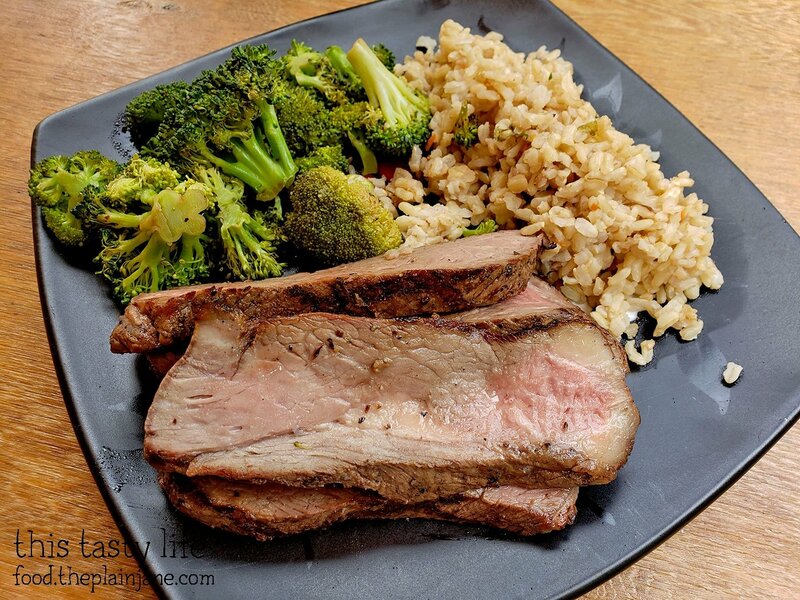 For dinner that evening, I had the Brazilian Tri Tip with brown rice and broccoli. 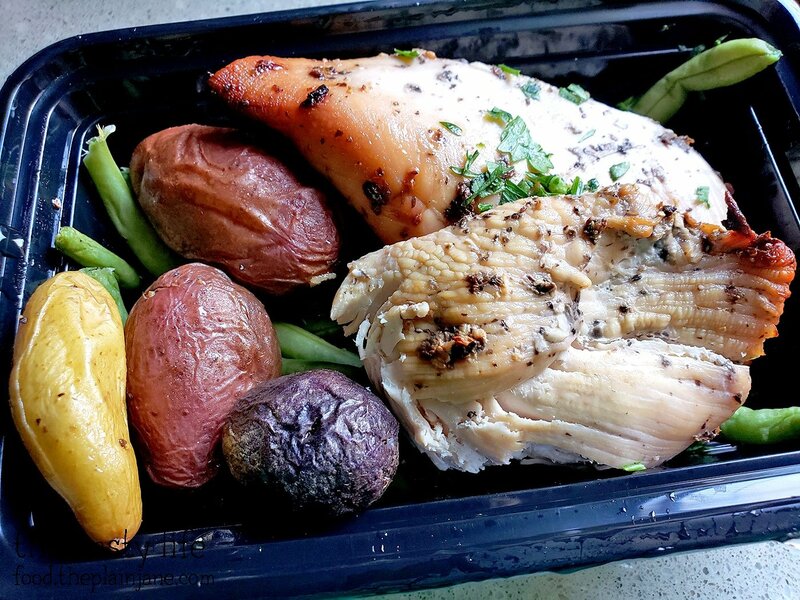 Eat Clean Meal Prep’s instructions recommend either microwave or oven heating. I decided to warm the tri tip in a hot pan on the stove and microwaved the side dishes. Here it is all plated up! This was my favorite of the three meals. The beef was quite tender and had a nice flavor to it. 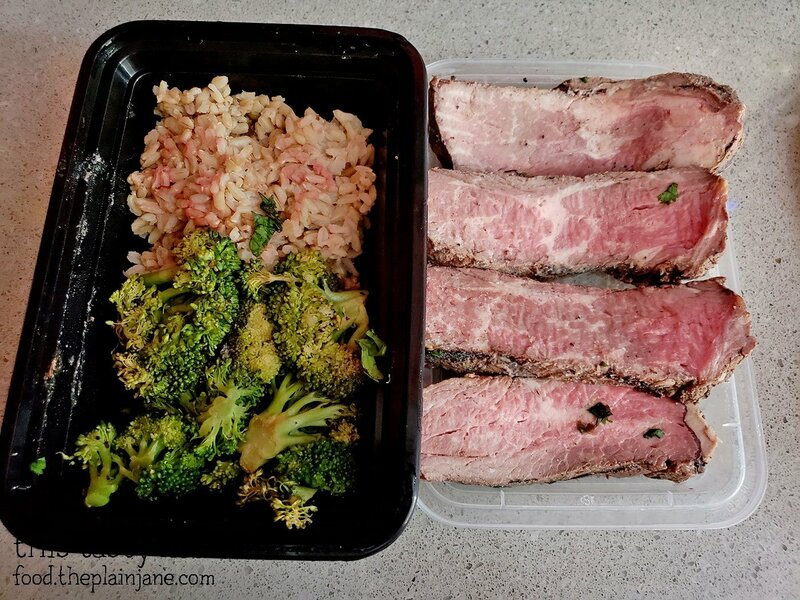 The broccoli was not appealing to look at, really, and had no other flavor or seasoning on it. Day two of Eat Clean Meal Prep foods! Another one of the overnight nights. I pretty much liked all of the overnight oats EXCEPT for the one with raisins in it. Ugh. Raisins. I would venture to say the overnight oats were my favorite part of the Eat Clean Meal Prep offerings. Too bad you can’t order just an overnight oats option to be delivered because I would be all over that! They do also have the option of egg protein bites! 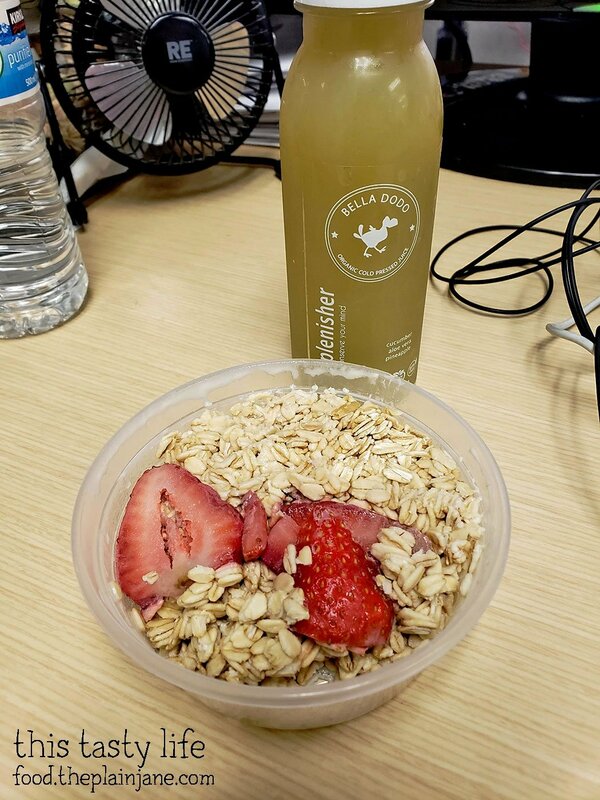 The fresh strawberries make it taste even better. Normally this is where you would see me review the second salad… but this second salad had all kinds of things I don’t like in it: arugula, artichoke, and olives. Ugh. That the entire base was arugula made this a no go for me since I can’t stand arugula. So sorry. I didn’t try this one. It may be fabulous for you if you like all of these things. 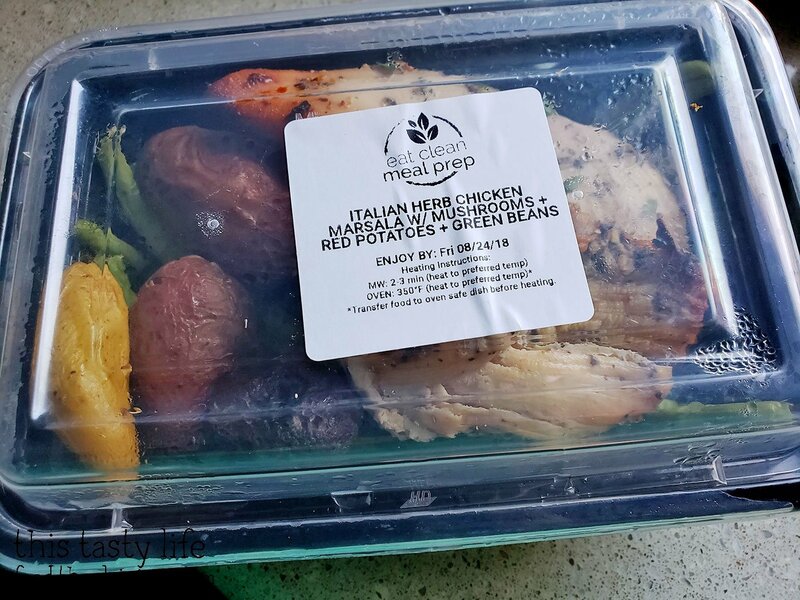 Since I received these meals as a sample, I wasn’t able to properly customize my meals like you would if used the website. There is an area when you order to make specifications for your meals. Next item I tried for dinner was the Italian Herb Chicken Marsala. It came with baby potatoes and green beans. I think the mushrooms were supposed to be in the sauce on the chicken, but there really wasn’t much sauce on this. The chicken was quite dry and tasted overcooked on this dish and that made the chicken not enjoyable to eat. The sides were fine though a bit on the bland side. This overnight oats had almonds in it! Yum yum! 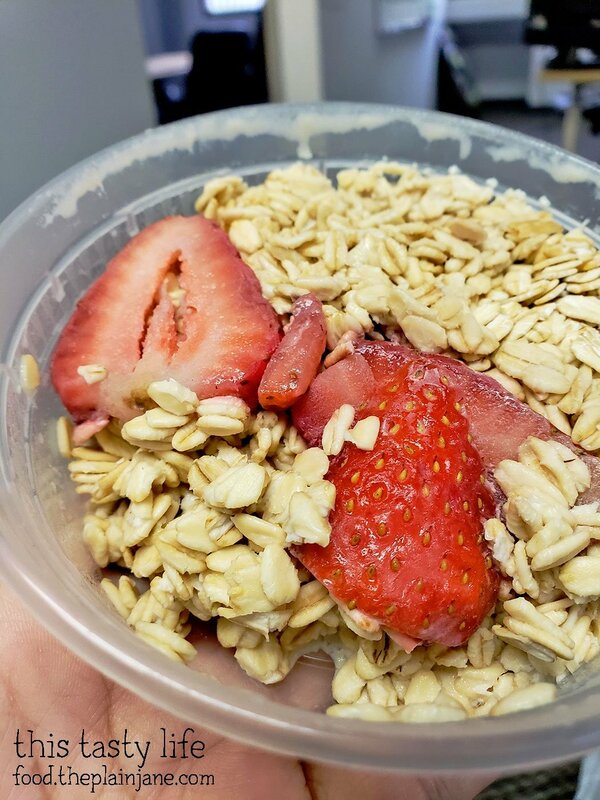 Again… the overnight oats were by far my favorite item from Eat Clean Meal Prep. The last item I sampled I actually brought with me to work for my lunch. 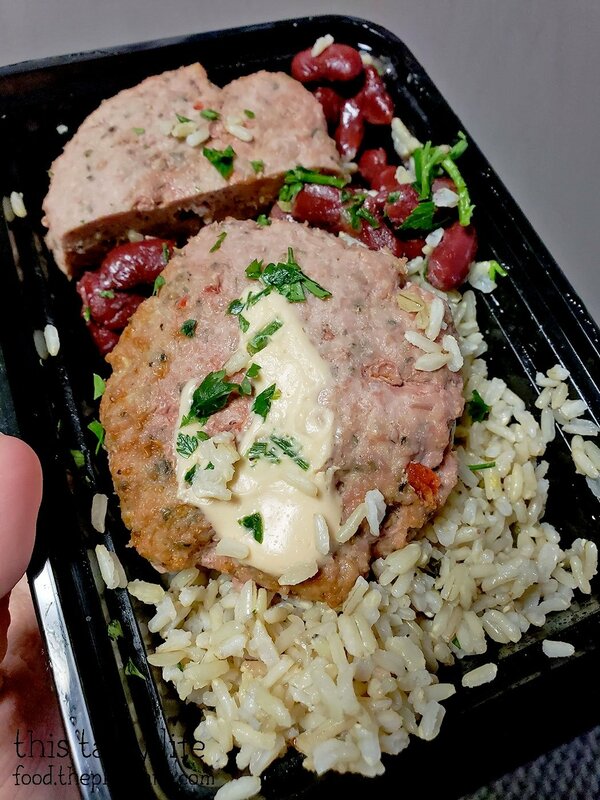 It was Bell Pepper & Onion Turkey burger with red beans and rice. Also it’s not really a “burger” since there’s no bread, it’s more like a turkey patty. The bell pepper taste was quite strong in this but the turkey was moist. The bell pepper was not my favorite flavor since it was a bit overpowering to me. Red beans and rice are also kind of meh in my opinion. I actually ended up giving this dish to my co-worker Emily who pretty much eats everything. She thought it was okay. She finished it off for me. Bless Emily. I previously stated in my initial review that there was not a way to customize your meal options, but have been corrected that when you check out in the online ordering system, there is an area to list your preferences. The customer service manager will also stay in contact to make sure you get what you like with your meals. Since I didn’t actually use the ordering system I missed this option, otherwise I would have tailored it more to my likes. 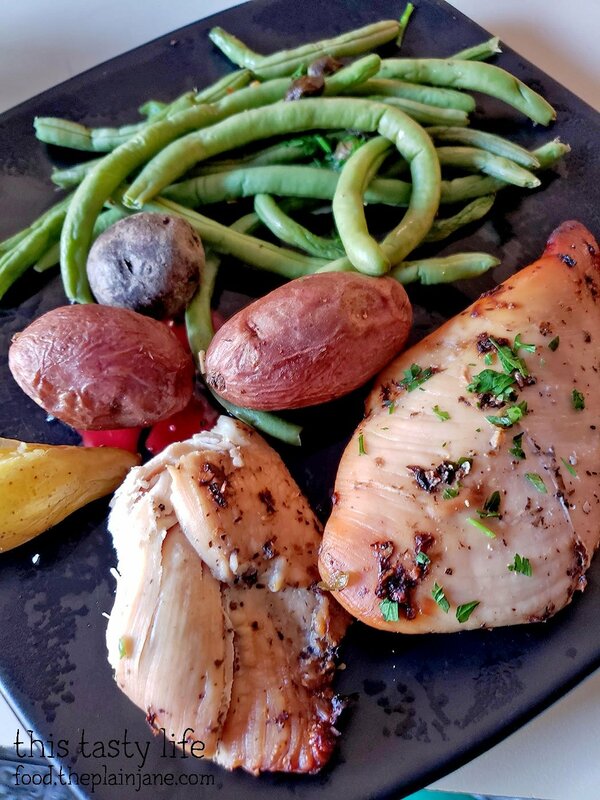 Eat Clean Meal Prep can and will customize your meals to your liking so you don’t get things you don’t like or can’t have! If you’re interested in checking them out, be sure to visit their website for more information at Eat Clean Meal Prep. 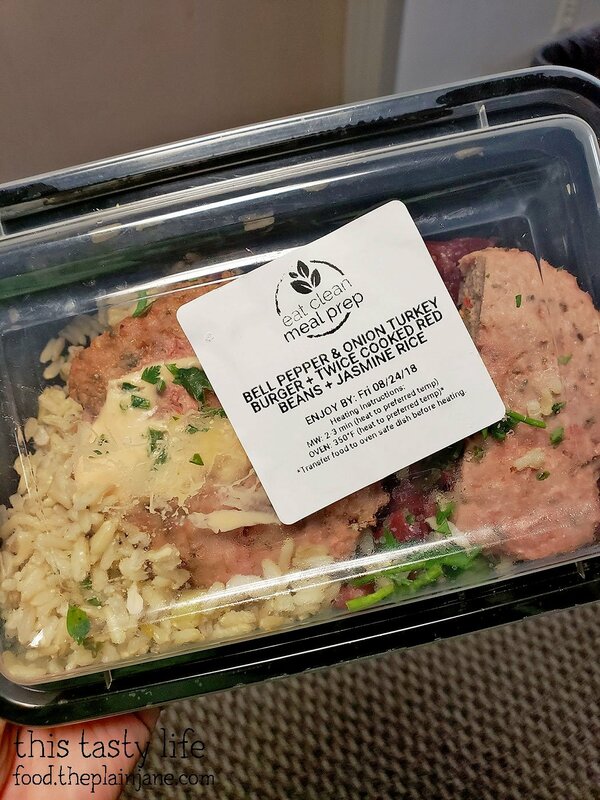 Disclaimer: I received complimentary food from Eat Clean Meal Prep in exchange for an honest review about their food. I was not further compensated and all opinions listed here are my own.